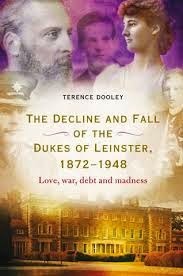 This book tells the story of the decline and fall of Ireland’s premier aristocratic family – the dukes of Leinster – who, for almost 300 years, lived amidst glorious splendour in their grand Palladian mansion, Carton House, Co. Kildare. From the 1870s they were engulfed by public and private events: Land War, Home Rule, the Great War, revolution, global economic collapse, sadness and madness, the consequences of the beautiful Hermione, 5th duchess of Leinster’s extra-marital affair and a profligate 7th duke. The story moves from the little Irish town of Maynooth to London to continental Europe and America before returning to Carton. In its epic scope it encapsulates the reasons for the decline and fall of so many Irish and British aristocratic dynasties. Having read and immensely enjoyed Terence Dooley's Murders at Wild Goose Lodge a few years ago I was looking forward to reading this book. His area of expertise is The Big Houses of Ireland and, in far too many cases, their ultimate demise. This is a highly readable work of meticulous accuracy resulting from painstaking research. The first few chapters deal with the history of the Fitzgerald family in Irish history from their arrival on these shores in the 12th century with the Normans, Silken Thomas and Lord Edward Fitzgerald were not only aristocratic but also rebellious towards the hegemony of the English in mid 16th century and 1798 respectively. It is when he examines the story of the Fitzgeralds with the marriage of the 5th Duke Gerald and Hermione that the decline begins and fact becomes stranger than fiction. The Land Acts of the late 19th century were with hindsight fatal blows to the social elite. These years saw the triumph of democracy at the cost of the aristocracy. The ruling classes lost reliable rental income from the "hoi polloi" and tried to replace it with investment income. In many cases this transition was attempted unsuccessfully and few were more unsuccessful than the Fitzgeralds. By this stage the 5th Duke Gerald and Hermione had died and left behind three children under eight years of age. The Big Houses of Ireland received three further blows of a devastating nature between 1914 and 1922 with World War 1, the Irish War of Independence and the Irish Civil War. The 6th Duke Maurice suffered from epilepsy and was treated as a "lunatic" until his early death in 1922. The solid and reliable Desmond died during World War 1. Edward the 7th Duke was financially irresponsible and was declared bankrupt on numerous occasions. He was also married four times. Carton House was saved from Edward thanks to the intervention of Henry Mallaby-Deeley. Mallaby-Deeley was "the fairy godmother of the estate" and may have ensured that Carton House remains standing today unlike so many other Big Houses. Eventually even Mallaby-Deeley lost the struggle to keep Carton House as a going concern and was forced to sell. All in all, this is a story that puts Evelyn Waugh's "Brideshead Revisted" in the shade. Nobody could invent this human tragedy. Terence Dooley is associate professor and director of the Centre for the Study of Historic Irish Houses and Estates, National University of Ireland, Maynooth. He is the author of several books on country houses and the land question in nineteenth- and twentieth-century Ireland.